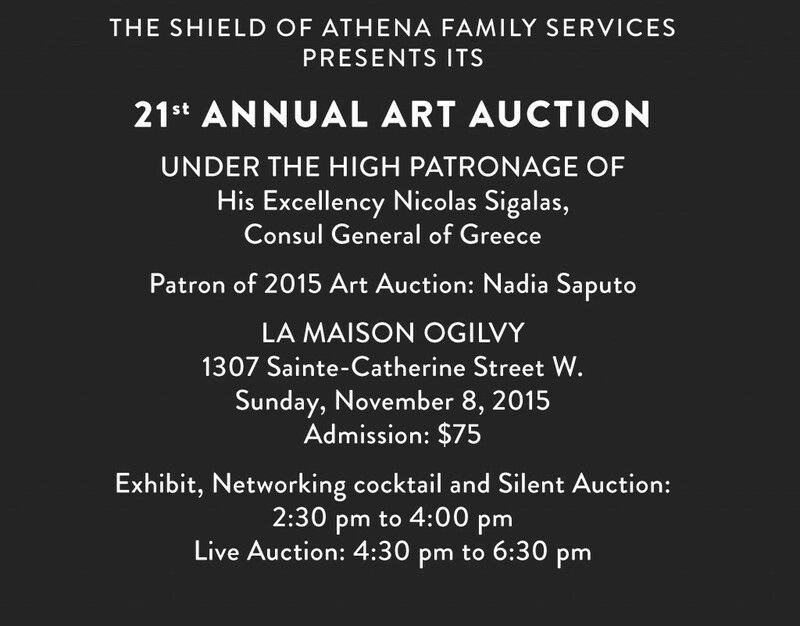 The Art Auction is the Shield of Athena’s major annual fund raising event. A glittering gathering of 400-plus guests, the Auction also raises awareness about family violence. 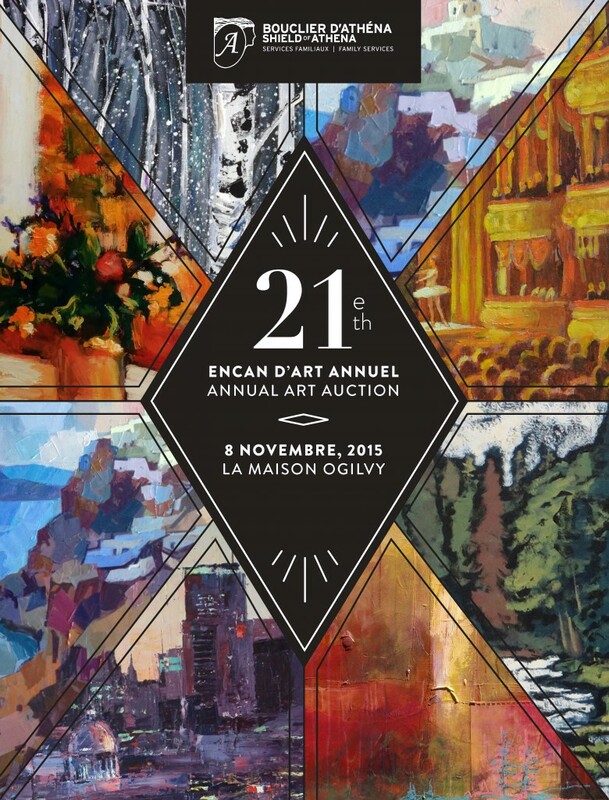 The first art auction was held in 1994 at the Town of Mount Royal City Hall. There were originally 12 participating artists and 40 works of art. Today, in its 21st year, it has become a signature event, that raises money for victims of family violence, primarily women and children. The event is always popular, both for the cause it supports and for the quality of art that can be obtained at reasonable prices. The participating artists are a mix of professionals and amateurs from all walks of life and diverse ethnic origins. This year’s funds will also go towards the establishment of our Second Step Resource, short term dwellings for women and children after they leave our emergency shelter. Proceeds will benefit victims of family violence. Your donations are always welcome and can be made by calling our offices at 514-274-8117. All works for the Art Auction are chosen by the Art Selection Committee, an independent group of artists, all of whom are trained in fine arts, are completely autonomous in their decision-making. No committee member, nor any person who is not at arm's length to the committee member, may submit artwork for consideration in the Auction. The Committee’s decisions are final. Steven Stowell is an historian of late medieval and Early Modern Italian art, whose research focuses on the devotional experiences and ritual uses of Renaissance art, the intersections between art and language, and the relationship between art and cultural discourses on gender and sexuality. He received his doctorate from Oxford University in 2009, and holds a BFA and an MA from Queen's University, Kingston. Prior to joining the faculty of Concordia University, Dr. Stowell held a SSHRC Postdoctoral Fellowship in the Department of Art at the University of Toronto, where he also taught in the Renaissance Studies Program at Victoria College. In his recent book, The Spiritual Language of Art: Medieval Christian Themes in Writings on Art of the Italian Renaissance, Dr. Stowell investigates the relationships between art, literature, and devotional responses to images. He has also published research in the journals Word & Image and Dante Studies. His current research projects explore anthropological approaches to Renaissance art, looking at how art objects were implicated in the discourses surrounding issues such as fertility and growth, chastity and abundance, and healing and nourishment. Dr. Stowell is also a practicing artist, with an interest in figurative representation; he has exhibited in Canada and the UK. Teodora Dimitrova is an Art History student in her fourth year at Concordia University that has a keen interest for contemporary art and architecture. During her academic career, she studied History & Theory of Architecture at Carleton University, Ottawa and History of Art at University College Cork, Ireland. The diversity of these educational institutions allowed her to have both theoretical and practical experience with prominent Canadian and International artists. In addition, her passion for traveling, lead her to explore the artistic traditions of France, Italy, Holland, UK and Ireland in the past year. Teodora is currently back in Montreal, interring for the Shield of Athena Family Service by assisting the organization at their Annual Art Auction with her acquired knowledge of art and multiculturalism. Fanis Mitronikas has participated in the Shield of Athena’s Annual Art Auction for the past seventeen years. As a member of the Art Selection Committee he has also been responsible for the setup and exhibit of the different art works. All this is nothing new for Fanis, as he had been the representative for the Royal Gallery on Sherbrooke and had his own gallery, Galerie Nova on Crescent street. At times contributing work from his own private collection, he feels proud to support the valiant cause of the Shield of Athena , all the while doing something that he also enjoys. Gary Peterson is the Auctioneer at Coach House Auctions in Vaudreuil-Dorion, Quebec, specializing in the sale and procurement of antique and reproduction furniture, fine art, porcelain, collectibles, jewellery, coins and paper money. Mr. Peterson has over 30 years of experience in the auction industry with extensive knowledge in the sale of antiques and collectibles. Previously, he was also involved in the sale of many heavy machinery and equipment companies including Molson O’Keefe Brewers in Montreal, Lowney’s Chocolate Manufacturing in Sherbrooke, Goodyear Tires in St. Hyacinthe, Quebec, Corelli Wines and many more industrial auctions. Mr. Peterson has worked with many non-profit organizations such as the Just For Kids Foundation and the Missing Children’s Network, in addition to raising funds for several years on behalf of the Atlantic Salmon Federation. · Graduated from the International Auction School in Boston, Mass. in 1981. · Graduate of the Certified Auctioneer's Institute, University of Indiana. · Graduate of the Canadian Certified Institute, University of Western Ontario, London, Ontario. Thank you for your interest, and your support in our fight against family violence.